Writing is an art that has been used by countless civilizations throughout history for a number of reasons. Novels, poems and all sorts of stories can be created and preserved through the art of writing. 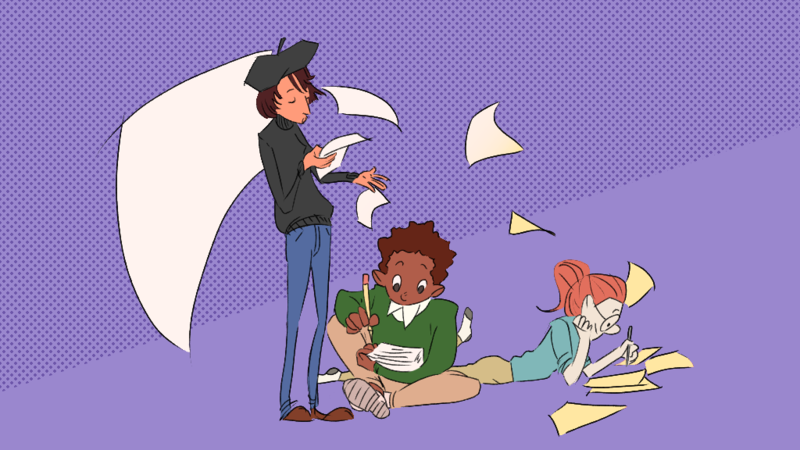 Whether your interest lies in creating new worlds, or simply expressing complex feelings, two clubs at RIT can help you foster your creative writing: Mental Graffiti and Storytellers. Although both clubs are writing related, their focuses differ. Mental Graffiti focuses on slam poetry while Storytellers focuses on prose creative writing. But these are not the only differing factors of the two clubs, and hopefully one will capture your writing-related interests. Mental Graffiti is led by third year Biomedical Science major Carolyn McGowan. According to her, new interested members introduce themselves at the beginning of a meeting. “Then we have a writing prompt or some sort of activity. More than likely it’ll be a writing prompt. That usually takes 30 minutes, 40 minutes. Then we share what we wrote,” said McGowan. Mental Graffiti’s vice president, Nicole Lockwood, a third year Chemical Engineering major, elaborated on what these routine writing prompts are like. During the sharing, members are critiqued on their poetry and given feedback. Given the nature of slam poetry, some of that feedback goes beyond simple writing advice. Mental Graffiti members can also reach out to leaders of the club if there is a specific activity that they want to do. According to McGowan and Lockwood, while the club has its planned events that are set in stone, it also is open to any member's suggestions. "We always try and stay in tune with ... the members of e-board who are there to really make sure that we’re communicating. Like, 'Did you guys like this workshop?' [or] 'What do you wish we did differently?'" said McGowan. Lockwood went on to give an example of how the club tries to cater to its members' interests. “So, we have open mics and slams for people to come and perform. But if people are like, ‘Hey, I’m really interested in writing odes!' we’ll do a prompt on an ode maybe the next week or the week later,” she said. Mental Graffiti also branches out and partners with other clubs on campus, including Storytellers. While the Spring semester is half over, Mental Graffiti has a number of events planned in the foreseeable future. The club will continue hosting open mics and competitive poetry slams. The club also has plans for Imagine RIT this year and Fringe Fest next year. Also, students who perform and do well at the club's on-campus poetry slams get the chance to compete on a national level. McGowan took pride in the work of her fellow RIT students and how well they performed in a slam poetry competition called the College Unions Poetry Slam Invitational. “Last year, we made it to the semifinals, which is a really big deal for our school. We’re one of like, one of two — I think — tech schools that goes to compete,” she said. Mental Graffiti also offers chapbooks, which are collections of student work compiled into books that the club sells at events. This year’s chapbook will be available in April, Lockwood said. For anyone interested in the art of poetry, they can purchase one of the chapbooks once they’re available or attend any of the future open mics and slams on Thursdays in the Fireside Lounge in the Student Alumni Union (SAU). If attending the event is difficult, the club meets each Tuesday at 8 p.m. in the Reading Room in the SAU. The Storytellers club president is third year Animation major Elizabeth Dettmann. She explained how the Storytellers's workshops lend themselves to a more free form of storytelling. “We usually do a workshop or some sort of activity that helps the club’s members learn a new aspect of writing or practice their writing. And we’ll usually have some activities in there [such as] some free writing or some collaborative exercises,” she said. Dettmann also devised a plan to help her club grow as well as foster growth in its current members. For the first time this year, Storytellers created a canon — a shared universe for all of the members to use as the setting for their stories. The goal was to make the club go in a more collaborative direction where everyone cared about each others works, said Dettmann. "Being able to create characters that interact with each other. Being able to talk to your friend about something that happened in their story or something that you wrote that they worked into their story. This is why workshops work really well, and critiques — but they work even better when you care about what’s being written,” she said. Myles Weider, a second year Game Design and Development major, acts as the club’s social media manager. They explained how Storytellers handles what they call sharing nights, in addition to the workshops. Storytellers focuses on prose writing, but that doesn't inhibit club members from becoming more open and personal with their writing. David Kelly, a fourth year Physics and Applied Math major and the club's logistics officer said that if someone wanted to, they can come to the club and express their feelings and frustrations through this form of communication. "What we write is ultimately influenced by how we feel and think," he said. "It’s not necessarily something we explicitly talk about. I know some of the members do, but some of us are much more subversive about it. I think that’s a huge part of it." This does not inhibit you from writing just for fun either. Storytellers is a club, as the name suggests, that exists for storytellers. Weider explained what they would communicate to any new and interested members, no matter the desire someone has for the club. “I would tell them that if they’re interested in storytelling or interested in other facets of it, or anything else related to stories, related to characters, or related to setting, or related to world building and they wanted to meet up with a group of like minded people, then come on by,” said Weider. The group is small, so members are able to form close relationships with each other, and people who aren't fond of large groups don't have to worry about getting lost in the crowd. “It’s much more small, I think," said Kelly. "I think that ... about 15 [members] show up on a regular basis." As for the current members of the club, Dettmann says that they all enjoy their time with Storytellers. "A lot of times, it will get a little loud in [the meeting room] because people are really excited about the activities and whatnot. A lot of laughs and stuff, so I think they enjoy them," she said. Storytellers meets each Friday at 7 p.m. in the Mosaic Room in the SAU. The club's email is storytellers@rit.edu, if any interested students have further questions. While RIT might be a technical institute, its students have a wide array of interests and talents. Clubs help students indulge in those hobbies while pursuing their degree. Mental Graffiti and Storytellers are just two of the many clubs on campus. They might not be as well known as some of the other, larger clubs, but they mean a lot to the students who call themselves members. For anyone interested in either poetry or prose, these clubs might be worth a look. They're the perfect way to find people with whom you share a common interest while allowing you to hone your skills in a group environment.